The State of the Union is dreadful. Are there any signs of hope in this era in which the Death-eaters have taken over the Ministry of Magic? Just back from the Sundance Film Festival, I am struck by the string of great David-and-Goliath documentary films I saw there. Taking on the NYPD: Crime + Punishment tells the story of twelve cops of color, a private investigator, a kid incarcerated for a crime he did not commit, and a mother who will not give up until her son is sprung. Together, they expose the widespread corruption within the New York Police Department, which has been pushing cops on the streets to fulfill quotas of arrests, to “get their numbers up” with extra credit for felonies, rather than focus on keeping the peace. Taking on money in politics: Dark Money reveals how big money is buying elections, focusing on a series of races in Montana for state senator and the governorship. An out-of-work reporter, a retiree lawyer, and a team of other everyday folk chart a path through deception and denial and discover evidence that leads to the conviction of the state Senate Majority Leader for breaking campaign finance law and to a renewed effort in the state of Montana for ethical elections. Taking on corporations poisoning our water: The Devil We Know investigates the history of the DuPont Corporation dumping chemicals into the Ohio River, promising that what was dumped poses no threat to humans, even as an entire herd of cattle is found suddenly dead near the waste dump site. In the one-company town of Parkersburg, West Virginia, too many children are born deformed. Seven deadly diseases are suddenly legion. And a handful of local red-state residents break from the company culture to take down the corporation. Taking on war: The Oslo Diaries tells the little-known story of secret meetings that took place in Norway between representatives of the Israeli state and the Palestinian people. A handful of brave souls are sent secretly to meetings that, if they were to be discovered, might lead to the death of all involved and the undoing of all they hold dear. This small group of enemies attempts to broker the impossible peace that has eluded so many. In the process, they bond and through this unlikely bonding, Israel and Palestine come as close as they have to date to a two-state solution and to the end of the Israeli-Palestinian conflict. Now you might say: Yeah, but look what happened next. Hard-right Israelis assassinated Yitzhak Rabin or perhaps, as it is says in the movie, assassinated the possibility for peace. But that’s not how I see it. Call me Pollyanna but I marveled at the bridge these political underlings almost built to peace in the Middle East. Sure it failed, but we would be foolish not to see the victory, or at least a possible path to victory, in the story. And possibility is precious right now. And then there’s Akicita: The Battle of Standing Rock in which indigenous activists refuse to allow the Dakota Access Pipeline to cut through sacred Lakotan lands and threaten the life-giving waters of the Cannonball River. Do they win? Yes. Is the pipeline built? Yes. So what’s the win?, you might ask. 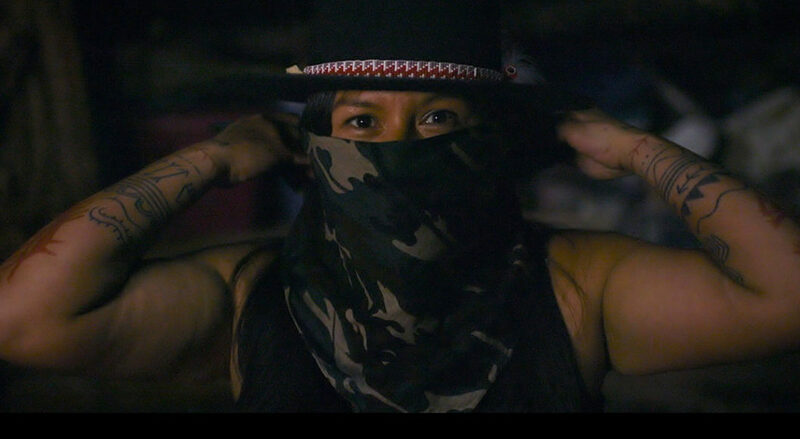 Well, in Akicita: The Battle of Standing Rock we see the birth of a new generation of activists willing to risk everything – I mean, everything – to decolonize their land, their bodies, their lives. 25 of those activists were at Sundance (weird, right?) and they named the frontlines on which they are currently laying down their lives – Bears Ear, British Columbia, the Enbridge’s Line 3 pipeline in Minnesota and Wisconsin. They are not defeated. They are in movement. In this gross time, in which we are led by gross leaders that bring out the grossest impulses in the Americans who support them, we need to have an imagination for winning, an imagination for taking down Goliath. We also need an imagination for the world as it should be. Watching the Israeli and Palestinian officials sharing ripe fruit and cigarettes together, seeing the fired journalist who has created his own online news source in the age of corporate-controlled media break the story that breaks the back of evil, witnessing the activist bring DuPont to it’s knees – the activist who was born with half a nose because his mother was faithful to the company that refused to recognize the sacrifice she made for their profit, I recover or discover the imagination I need to topple this evil empire in power. Watching the Oceti Sakowin camp at Standing Rock where indigenous people from tribes as far afield as Iceland and New Zealand convene along with a next generation of activists certain that first nations people must lead us out of the hell colonization created, watching the dance, hearing the music, beholding the best in our human nature blocking corporation and state in the face of all violence, mace and mayhem, I recognized that we can do this. PS: I have linked the film titles to the filmmakers’ websites who made them. Write to them. Ask them how you can bring these films to your communities. Who knows how they will respond, but if you are like me, you need to see Goliath go down right about now. PPS: And if you need help, write Sarah Masters at smasters@auburnseminary.com. She runs the new Hartley Media Impact Initiative at Auburn, committed to getting the best media to all you leaders of faith and moral courage to help you stand for justice.